If you could choose where to live, where would you go? Having travelled here and there around the world, quite often I’m faced with this question. Usually I answer: Australia…if only it wasn’t so damn far away! In fact, its distance from my home in Italy (14,000 km) is the only flaw I can find. In the minds of Italian people–perhaps Europeans in general–Australia is an exotic destination, a big question mark at the antipodes of the globe. In my view, Australia’s most fascinating feature is its unique combination of civilization and nature, elements that, in this country, appear in symbiosis. 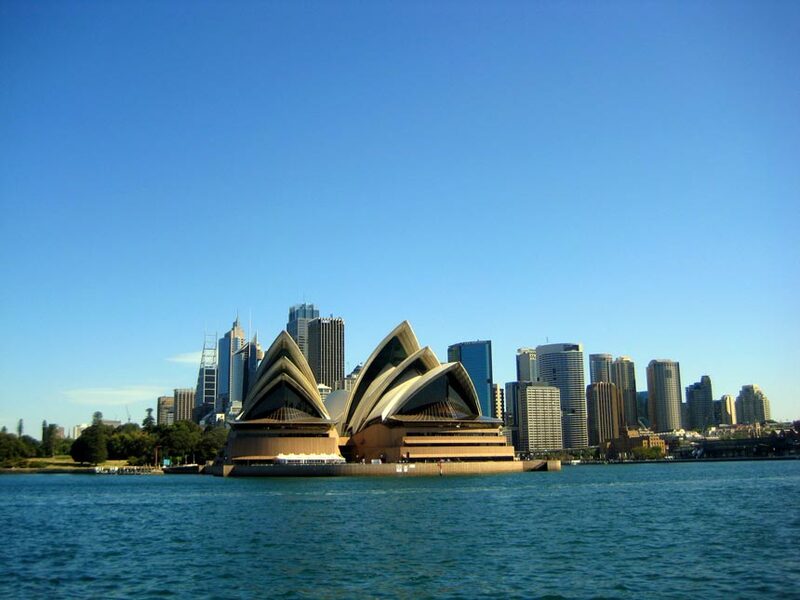 Australian cities are generally listed in the top 10 of the world’s most liveable cities. Indeed Melbourne and Sydney are fabulous places to live. Despite their relatively short history, they don’t lack great landmarks, some of which are real symbols of modernity. The Sydney Harbour, for instance, with the iconic Sydney Harbour Bridge and Sydney Opera House, is without a doubt one of the most beautiful urban landscapes one can possibly hope to see. Less glamour and garish, but more cozy, Melbourne boasts some majestic sport venues such as the Melbourne Cricket Ground (where I attended a footy match with little understanding of what was going on) and the Rod Laver Arena (one of the world tennis temples). As far as more traditional monuments are concerned, the Shrine of Remembrance and the neoclassical State Library of Victoria are two architectural jewels I didn’t expect to see. Bustling Federation Square, in the heart of Melbourne’s CBD (central business district), is a striking contrast of modernity and antiquity: on the one side the gothic St. Patrick’s Cathedral and the nineteenth-century Flinders Street Railway Station; contrasting those, on the other side are the space age building of the Australian Centre for the Moving Image and the silhouette of skyscrapers. 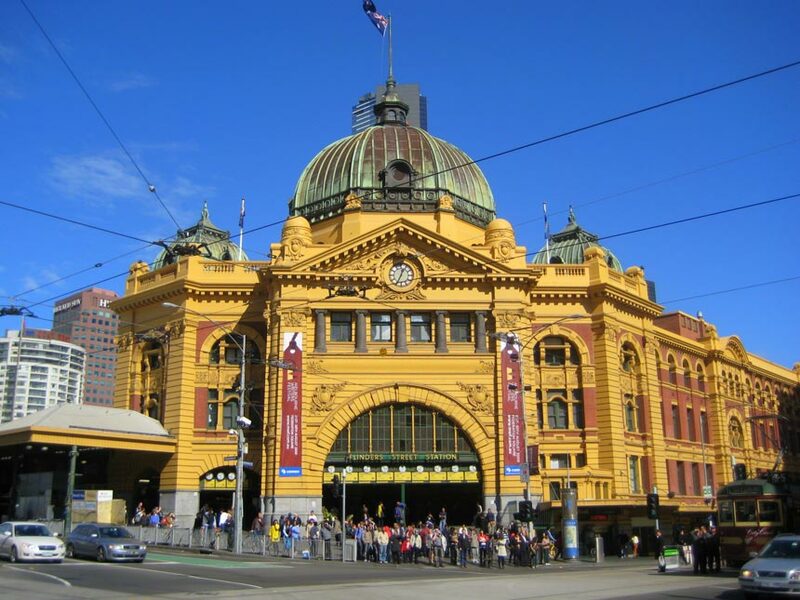 Melbourne’s and Sidney’s cultural and night scene is extremely vibrant and exciting. Concerts, exhibitions, street art, trendy and alternative bars and clubs constitute an essential part of the urban setting. If Australia is such a cool place, the credit should go to the Australians. I’ve never met more easygoing and open-minded people. Food is perhaps the best example of Australia’s cosmopolitanism and multiculturalism. The range of choice for dining includes the traditional Australian barbecue, the exotic flavors of Asian cuisine and the classical Greek and Italian restaurants. During my stay, I would eat something new everyday. Earlier I talked of civilization and nature coexisting in harmony. This is what I mean: at St. Kilda’s waterfront, in Melbourne, you can watch penguins taking shelter under the rocks at dusk; while in Sidney you can enjoy world famous beaches like Manly and Bondi beach. 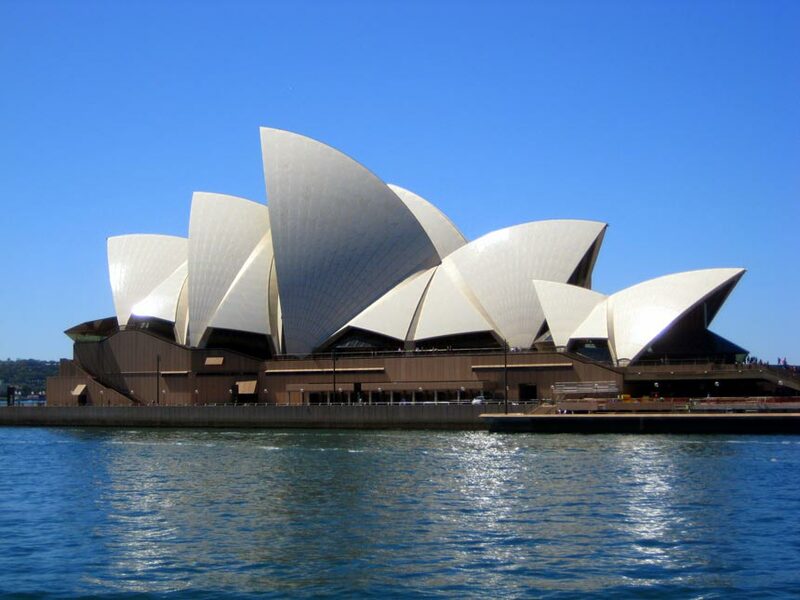 In order to catch Australia’s true allure, however, one must leave the cities behind and head towards the rural areas. Angeliki (my girlfriend) and I started our grand tour of the country from Melbourne. 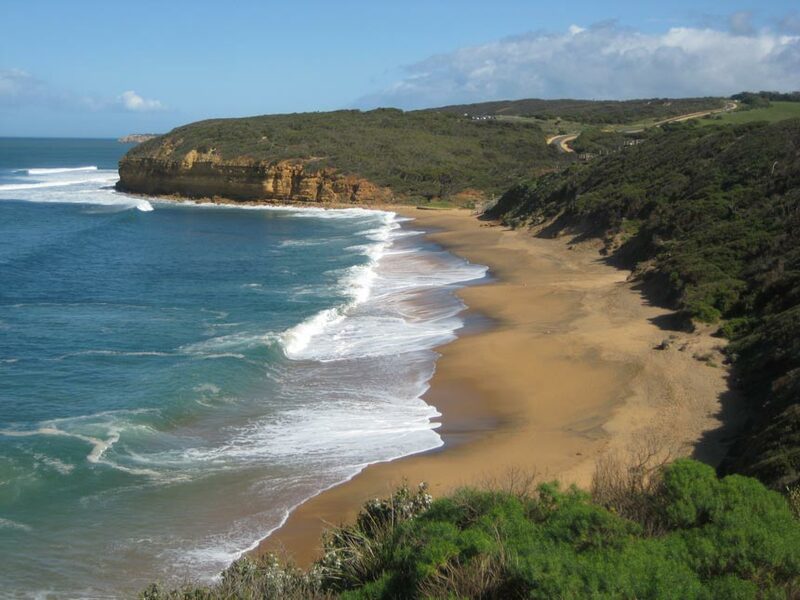 From there we drove the legendary Great Ocean Road, one of the most scenic coastal roads in the world: 244 km of winding curves crossing rainforests and overviewing cliffs smashed by foamy waves. There are plenty of activities you can do along the way: surfing (which I’m not keen on, sorry); enjoying the marvelous vistas and maybe attempting to spot some whales; walking in the forest or on the canopy and encountering the pretty koalas and more wildlife. 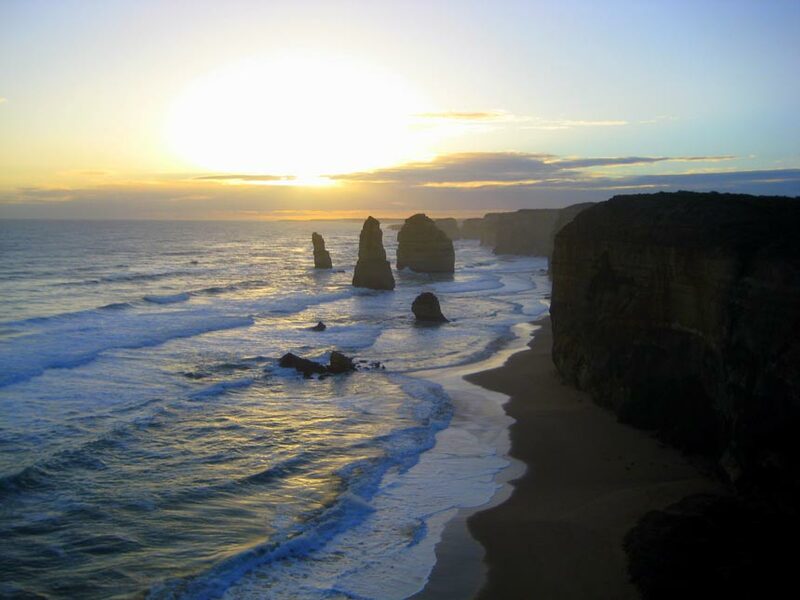 At sunset a crowd gathers around the 12 Apostles, not to listen to a sermon but to witness the miracle of the sun sinking in the splendid frame of these cliffs. 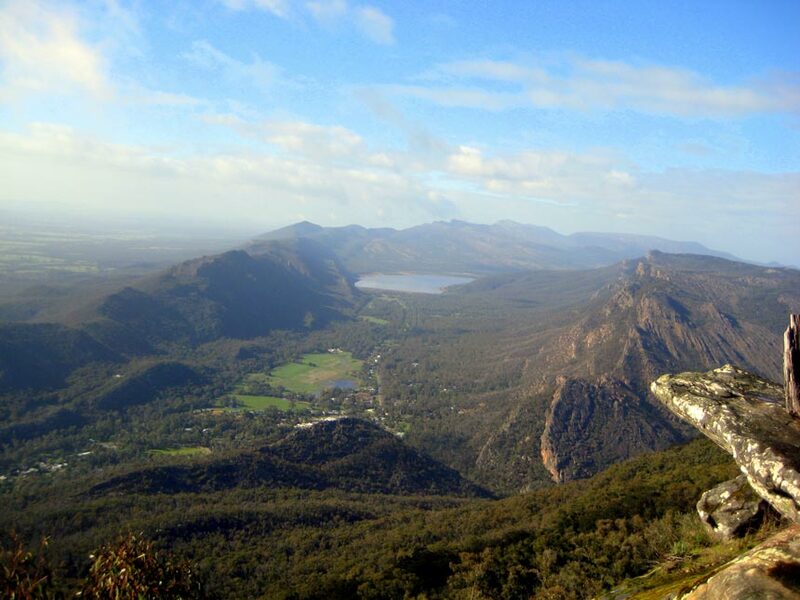 Another destination not to be missed in the State of Victoria are the Grampians, a mountain range of incredible beauty. I will never forget the hike from Halls Gap to the Pinnacle, where, after having crossed the narrow canyon, we found ourselves literally plunged into the clouds. The real Outback, though, is the Red Center: a boundless ochre desert in which time and space become loose. The mesmerizing monotony of the landscape is interrupted only by rocky ridges so unlikely to appear like mirages at the horizon. Uluru (Ayers Rock), the most renowned of these ridges, is a natural cathedral of colossal size that according to aboriginal tales was created during Dreamtime. 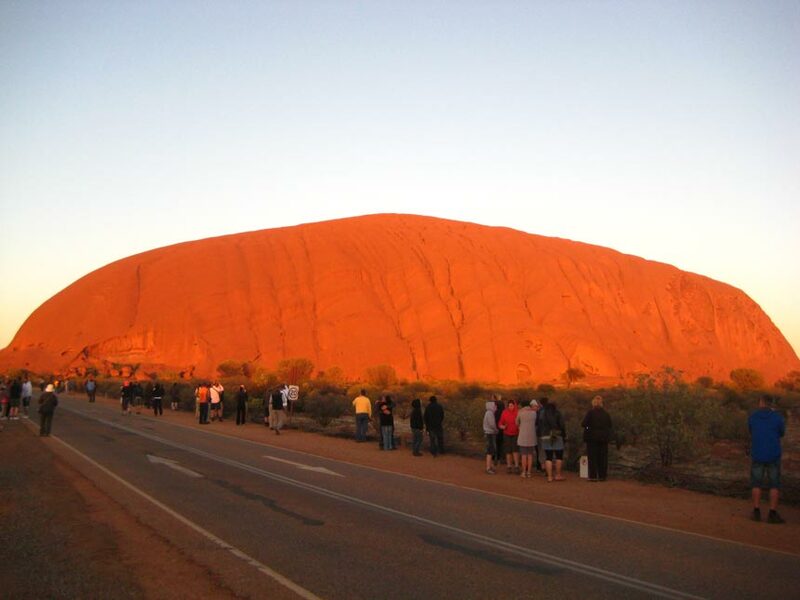 Observing the surface of Uluru changing colour as the sun goes down, perhaps with a glass of champagne, is one of tourists’ favorite experiences. I admit that we did that too. 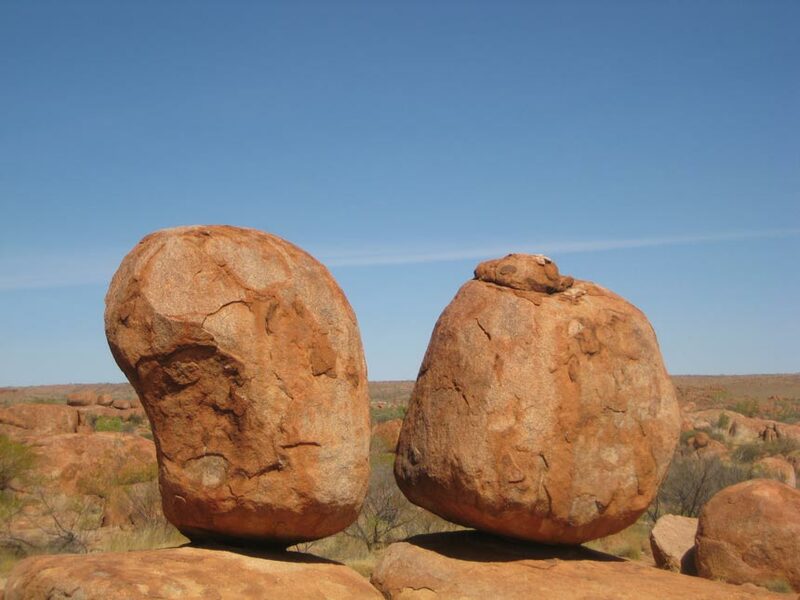 From Uluru to get to Darwin, you take the Red Centre Way and keep going straight for 2000 km. 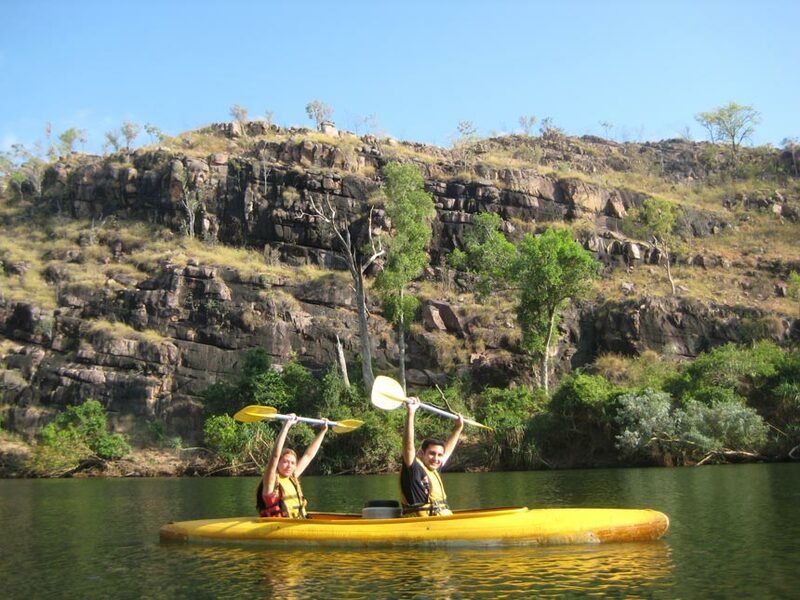 On the way we make several stops in amazing places: desolate towns, absurd rock formations like the Devil’s Marbles and the spectacular Katherine Gorge where we go kayaking. The nights in the outback are magical as well. We gather around the bonfire, grill kangaroo and camel meat, sing, drink some beer and gaze at the starry sky all rolled up in our sleeping bags. 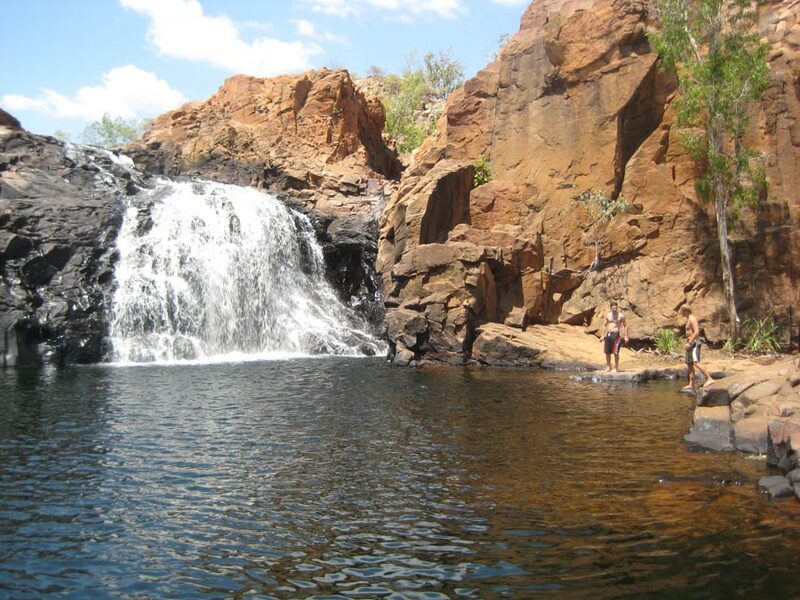 Once we get to Kakadu National Park, the dry climate and the barren moors have made way to the humidity of the tropics and to an incredible variety of landscapes and biodiversity. We drive and hike through floodplains, billabongs, rivers, forests and rocky escarpments, watching the fauna and the flora changing with them. 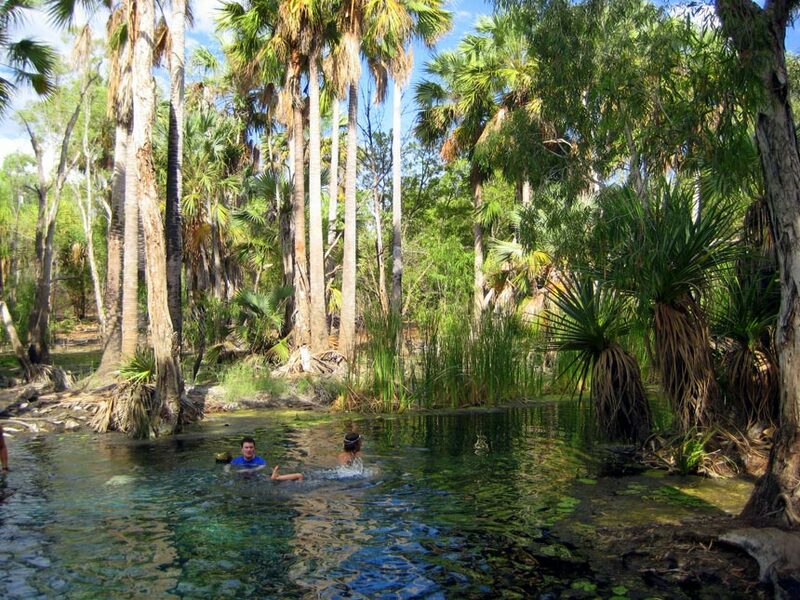 We get the chance to swim in natural pools under high waterfalls and come across dozens of rock paintings dating back to thousands of years. This is the ancestral homeland of the Bininj Mungguy who proudly give us an insight of life in the bush. Leaving Northern Territory for Queensland, we find that the climate gets milder and nature less wild. The East Coast is an almost uninterrupted succession of golden beaches, pristine sea, lavish vegetation and pretty towns and cities. It would be worth it, exploring it meter by meter, but unfortunately we have only two weeks to cover the 3500 km between Cairns and Melbourne. Some stretches of Queensland are really little pieces of heaven on Earth: Cape Tribulation, Magnetic Island and above all the Whitsunday Islands in the Great Barrier Reef, that we reach on a 3-day sailing cruise. 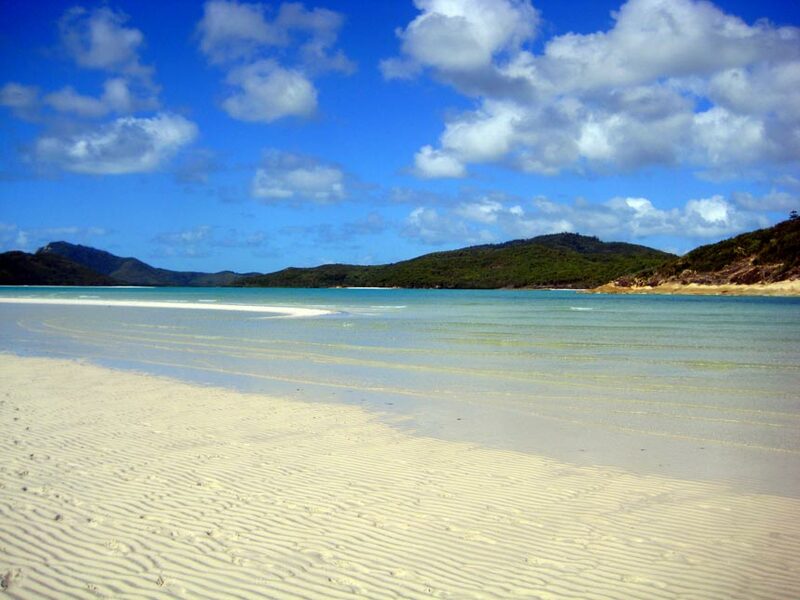 The sand of the Whitsundays is soft as snow. Diving in its crystal-clear waters, the marvelous spectacle of multicolored fish and corals is revealed to us. Next stop is Fraser Island, the world’s largest sandy island. On the island there are no towns nor roads, so we explore it by 4WD driving along the water edge and dirt tracks in the forest. The attractive towns of Noosa and Byron Bay, Brisbane and the Gold Coast (a paradise for surfers) are the highlights on our way to Sidney and then to Melbourne. Before our stay in the Southern Hemisphere comes to an end, we treat ourselves with a trip to Tasmania, Australia’s most remote and wild frontier. 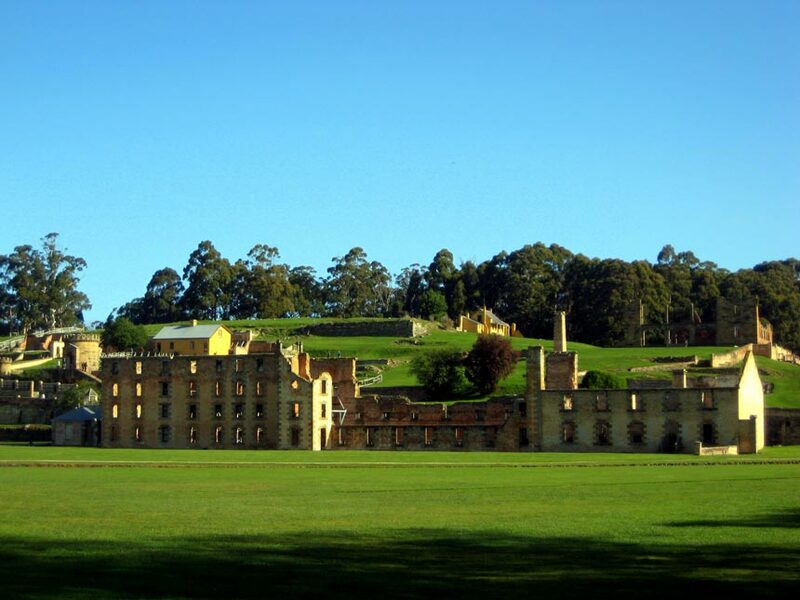 The visit to the penal colony of Port Arthur—a UNESCO World Heritage Site—arouses contrasting feelings in us. We find it difficult to accept that in such a peaceful and pleasant location there used to be a place of suffering, despair and death. 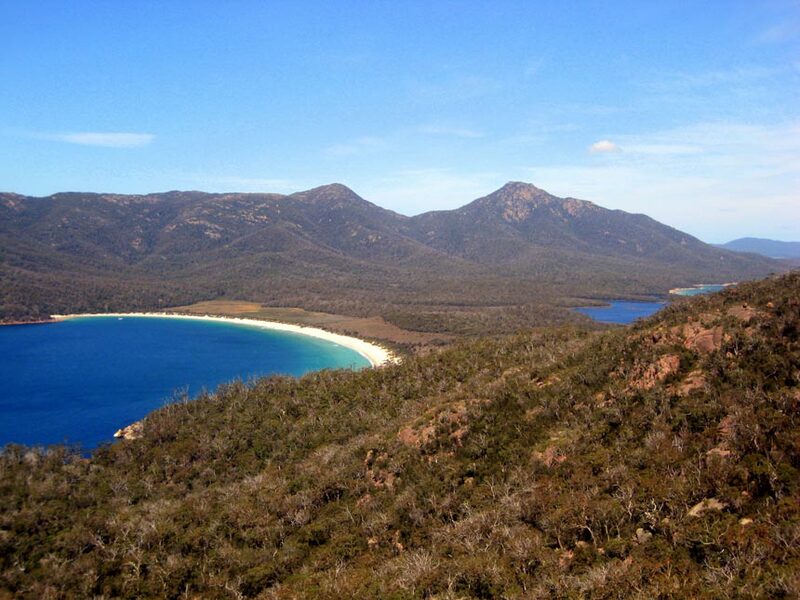 Hiking in Wineglass Bay, in Freycinet National Park, we get another evidence of nature’s unmatchable artistic mastery: a crescent of dazzling white sand meeting the turquoise water, against the backdrop of bizarre, pink granite rocks. The lively city of Hobart, framed by Mt. Wellington and the ocean, is the last destination in our short Tasmanian trip. While leaving from Melbourne headed back to the Old Continent, Angeliki and I know we will miss Australia and express the wish of coming back someday. Next time we might well decide to stay for good.